This article is about the Japanese sect. For the original Chinese sect, see Caodong. For other uses, see Soto (disambiguation). Sōtō Zen or the Sōtō school (曹洞宗, Sōtō-shū) is the largest of the three traditional sects of Zen in Japanese Buddhism (the others being Rinzai and Ōbaku). It is the Japanese line of the Chinese Cáodòng school, which was founded during the Tang dynasty by Dòngshān Liánjiè. It emphasizes Shikantaza, meditation with no objects, anchors, or content. The meditator strives to be aware of the stream of thoughts, allowing them to arise and pass away without interference. The Japanese brand of the sect was imported in the 13th century by Dōgen Zenji, who studied Cáodòng Buddhism (Chinese: 曹洞宗; pinyin: Cáodòng Zōng) abroad in China. Dōgen is remembered today as the co-patriarch of Sōtō Zen in Japan along with Keizan Jōkin. With about 14,000 temples, Sōtō is one of the largest Japanese Buddhist organizations. [a] Sōtō Zen is now also popular in the West, and in 1996 priests of the Sōtō Zen tradition formed the Soto Zen Buddhist Association based in North America. The original Chinese version of Sōtō-shū, i.e. the Caodong-school (曹洞宗) was established by the Tang dynasty monk Dongshan Liangjie (洞山良价 Ja: Tōzan Ryōkai) in the 9th century. Perhaps more significantly for the Japanese brand of this sect, Dōgen among others advocated the reinterpretation that the "Cao" represents not Caoshan, but rather "Huineng of Caoxi temple" 曹渓慧能 (Sōkei Enō); zh:曹溪慧能). The branch that was founded by Caoshan died off, and Dōgen was a student of the other branch that survived in China. A precursor to the sect is Shítóu Xīqiān (Ch. 石頭希遷, ca.700 – ca.790), the attributed author of the poem Sandokai, which formed the basis of Song of the Precious Mirror Samadhi of Dongshan Liangjie (Jp. Tōzan Ryōkai) and the teaching of the Five Ranks. The Caodong-teachings were brought to Japan in 1227, when Dōgen returned to Japan after studying Ch'an in China and settled at Kennin-ji in Kyoto. Dōgen had received Dharma transmission from Tiantong Rujing at Qìngdé Temple, where Hongzhi Zhengjue once was abbot. Hongzhi's writings on "silent illumination" had greatly influenced Dōgen's own conception of shikantaza. This assertion of the primacy of Zen aroused the anger of the Enryaku-ji monks, who succeeded in driving Dōgen from the Kennin-ji where he had settled after his return to the capital. ... to create new monastic institutions based on the Chinese model and risk incurring the open hostility and opposition of the established schools. The elements of Sōtō practice that contributed most to the success of the school in medieval Japan were precisely the generic Buddhist monastic practices inherited from Sung China, and ultimately from India. The Sōtō Zen style of group meditation on long platforms in a sangha hall, where the monks also took meals and slept at night, was the same as that prescribed in Indian Vinaya texts. The etiquette followed in Sōtō monasteries can also be traced back to the Indian Vinaya. Dōgen was succeeded around 1236 by his disciple Koun Ejō (1198–1280), who originally was a member of the Daruma school of Nōnin, but joined Dōgen in 1229. Ejō started his Buddhist studies at Mount Hiei, the center of Tendai studies. following his stay there he studied Pure Land Buddhism under Shōkū, whereafter he joined the Daruma school of Nōnin by then led by Kakuan. Ejō, like Dōgen, believed in the primacy of Zen Buddhism. He resisted efforts from outside to water down the tradition with other beliefs. A large group from the Daruma-school under the leadership of Ekan joined the Dogen-school in 1241, after severe conflicts with the Tendai and Rinzai schools. Among this group were Gikai, Gien and Giin, who were to become influential members of Dōgen's school. [W]ith the premature death of Dōgen the group lost its focus and internal conflicts led to a split. Dōgen's followers soon introduced such esoteric elements as prayers and incantations into the teaching. Opposition arose, and in 1272 Ejō resumed the position of abbot. After his death in 1280, Gikai became abbot again, strengthened by the support of the military for magical practices. Opposition arose again, and Gikai was forced to leave Eihei-ji, and exiled to Kaga Province, Dajō-ji (in Ishikawa Prefecture). He was succeeded by Gien, who was first trained in the Daruma-school of Nōnin. His supporters designated him as the third abbot, rejecting the legitimacy of Gikai. The second most important figure in Sōtō, Keizan, belonged to this dissident branch. Keizan received ordination from Ejō when he was, twelve years old, shortly before Ejō's death When he was seventeen he went on a pilgrimage for three years throughout Japan. During this period, he studied Rinzai, Shingon and Tendai. After returning to Daijō-ji, Keizan received dharma transmission from Gikai in 1294, and established Joman-ji. In 1303 Gikai appointed Keizan as abbot of Daijō-ji, a position he maintained until 1311. Though today Dōgen is referred as the founder of Sōtō, for a long period Sōtō history recognized several important ancestors, next to Dōgen. In 1877 the heads of the Sōtō community acknowledged Keizan for a brief period as the overall founder of the Sōtō sect. Both terms mean the original patriarch, that is, the founder of Japanese Sōtō Zen tradition. At the end of the Kamakura period, Dōgen's school centered around four centers, namely Eihei-ji, Daijo-ji monastery, and the temples Yoko-ji and Soji-ji. Soji-ji became the most influential center of the Dōgen school. During the Muromachi period the Rinzai school was the most successful of the schools, since it was favoured by the shōgun. But Soto too spread out over Japan. Gasan Jōseki (1275–1365) and Meiho Sotetsu were Keizan's most prominent students. Gasan too started his Buddhist studies at mount Hiei. He became head of Soji-ji in 1324. Gasan adopted the Five Ranks of Tung-shan as a fit vehicle to explain the Mahayana teachings. Sotetsu became head of Yoko-ji in 1325. Initially his influence soon grew. In 1337 Sotetsu was appointed as abbot of Daijo-ji. After a period of war Japan was re-united in the Azuchi–Momoyama period. Neo-Confucianism gained influence at the expense of Buddhism, which came under strict state control. The power of Buddhism decreased during the Tokugawa period. Buddhism had become a strong political and military force in Japan and was seen as a threat by the ruling clan. Measures were taken to control the Buddhist organisations, and to limit their power and influence. The temple hierarchy system was centralized and unified. Japan closed the gates to the rest of the world. New doctrines and methods were not to be introduced, nor were new temples and schools. The only exception was the Ōbaku lineage, which was introduced in the 17th century during the Edo period by Ingen, a Chinese monk. The presence of these Chinese monks also influenced the existing Zen-schools, spreading new ideas about monastic discipline and the rules for dharma transmission. The Sōtō school started to place a growing emphasis on textual authority. In 1615 the bakufu declared that "Eheiji's standards (kakun) must be the rule for all Sōtō monks". In time this came to mean all the writings of Dōgen, which thereby became the normative source for the doctrines and organisation of the Sōtō school. Dōgen scholarship came to a central position in the Sōtō sect with the writings of Menzan Zuihō (1683–1769), who wrote over a hundred works, including many commentaries on Dōgen's major texts and analysis of his doctrines. Menzan promoted reforms of monastic regulations and practice, based on his reading of Dōgen. Another reformation was implemented by Gentō Sokuchū (1729–1807), the 11th abbot of Eihei-ji, who tried to purify the Sōtō school, de-emphasizing the use of kōans. In the Middle Ages kōan study was widely practiced in the Sōtō school. Gentō Sokuchū started the elevation of Dōgen to the status he has nowadays, when he implemented new regulations, based on Dōgen's regulations. The Sōtō hierarchy, no doubt afraid of what other radical reformers might find in Dōgen's Shobo Genzo, a work open to a variety of interpretations, immediately took steps to restrict access to this traditional symbol of sectarian authority. Acting at the request of the Sōtō prelates, in 1722 the government prohibited the copying or publication of any part of Shobo Genzo. During the Meiji period (1868–1912) Japan abandoned its feudal system and opened up to Western modernism. Shinto became the state religion, and Buddhism was coerced to adapt to the new regime. Rinzai and Sōtō Zen chose to adapt, with embarrassing consequences when Japanese nationalism was endorsed by the Zen institutions. War endeavours against Russia, China and finally during the Pacific War were supported by the Zen establishment. Within the Buddhist establishment the Western world was seen as a threat, but also as a challenge to stand up to. Parties within the Zen establishment sought to modernize Zen in accord with Western insights, while simultaneously maintaining a Japanese identity. Dōgen's memory has helped keep Eihei-ji financially secure, in good repair, and filled with monks and lay pilgrims who look to Dōgen for religious inspiration ... the Dōgen we remember is a constructed image, an image constructed in large measure to serve the sectarian agendas of Eihei-ji in its rivalry with Sōji-ji. We should remember that the Dōgen of the Shōbōgenzō, the Dōgen who is held up as a profound religious philosopher, is a fairly recent innovation in the history of Dōgen remembrances. Funerals continue to play an important role as a point of contact between the monks and the laity. Statistics published by the Sōtō school state that 80 percent of Sōtō laymen visit their temple only for reasons having to do with funerals and death, while only 17 percent visit for spiritual reasons and a mere 3 percent visit a Zen priest at a time of personal trouble or crisis. If you want to study Buddhism, I recommend the Japanese universities. If you want to learn the ceremonies practiced by the Sōtō School, you need only head for Eihei-ji or Soji-ji. In the 20th century Sōtō Zen spread out to the west. Shunryū Suzuki played a central role in bringing Sōtō to the west. Suzuki studied at Komazawa University, the Sōtō Zen university in Tokyo. In 1959 Suzuki arrived in California to attend to Soko-ji, at that time the sole Sōtō temple in San Francisco. His book Zen Mind, Beginner's Mind has become a classic in western Zen culture. Suzuki's teaching of Shikantaza and Zen practice led to the formation of the San Francisco Zen Center, one of the largest and most successful Zen organizations in the West. The training monastery of the San Francisco Zen center, at Tassajara Hot Springs in central California, was the first Buddhist Monastery to be established outside Asia. Today SFZC includes Tassajara Monastery, Green Gulch Farm, and City Center. Various Zen Centers around the U.S. are part of the dharma lineage of San Francisco Zen Center and maintain close organizational ties with it. The Sanbo Kyodan, in which Sōtō and Rinzai are merged, is also of central importance western Sōtō Zen. Their lineage, starting with Hakuun Yasutani, includes Taizan Maezumi, who gave dharma transmission to various American students, among them Tetsugen Bernard Glassman, Dennis Genpo Merzel disrobed in disgrace, Charlotte Joko Beck and John Daido Loori. In Europe the Sanbo Kyodan has been influential via Hugo Enomiya-Lassalle, and via students of Dennis Genpo Merzel, especially in the Netherlands. Sanbo Kyodan was also connected to the Soen Nakagawa–Eido Tai Shimano lineage, (disgraced), due to a personal fondness of Soen for the teaching practices of Harada roshi, who was the teacher of Hakuun Yasutani. The Antaiji-based lineage of Kōdō Sawaki is also widespread. Sawaki's student and successor as abbot Kōshō Uchiyama was the teacher of Shōhaku Okumura who established the Sanshin Zen Community in Bloomington, Indiana, and his student Gudō Wafu Nishijima was Brad Warner's teacher. Houn Jiyu-Kennett (1924-1996) was the first western female Soto Zen priest. She converted to Buddhism in the early 1950s, and studied in Sojiji, Japan, from 1962 to 1963. Formally, Keido Chisan Koho Zenji was her teacher, but practically, one of Koho Zenji's senior officers, Suigan Yogo roshi, was her main instructor. She became Oshō, i.e. "priest" or "teacher," in 1963. In 1969 she returned to the west, founding Shasta Abbey in 1970. The larger majority of North American Sōtō priests[c] joined together in 1996 to form the Soto Zen Buddhist Association. 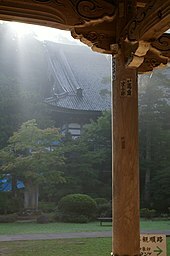 While institutionally independent of the Japanese Sōtōshū, the Sōtō Zen Buddhist Association works closely with what most members see as their parent organization. With about one hundred fully transmitted priests, the Sōtō Zen Buddhist Association now represents about 80% of Western Sōtō teachers. The Soto Zen Buddhist Association approved a document honoring the women ancestors in the Zen tradition at its biannual meeting on October 8, 2010. Female ancestors, dating back 2,500 years from India, China, and Japan, may now be included in the curriculum, ritual, and training offered to Western Zen students. In the Sōtō school of Zen, Shikantaza, meditation with no objects, anchors, or content, is the primary form of practice. The meditator strives to be aware of the stream of thoughts, allowing them to arise and pass away without interference. In the first works he wrote after his return to Japan, the Fukan zazengi (Principles for the universal promotion of zazen) and Bendōwa (Distinguishing the Way), he advocated zazen (seated meditation) as the supreme Buddhist practice for both monks and laypersons. Sōtō Zen was often given the derogatory name "farmer Zen" because of its mass appeal. Some teachers of Zen would say that the reason why it was called "farmer Zen" was because of its down-to-earth approach, while the Rinzai school was often called "samurai Zen" because of the larger samurai following. The latter term for the Rinzai can be somewhat misleading, however, as the Sōtō school also had samurai among its rosters. Sōtō Zen, like all of Zen, relies on the Prajnaparamita Sutras, as well as general Mahayana Buddhist sutras, such as the Lotus Sutra, the Brahma Net Sutra and the Lankavatara Sutra. Zen is influenced in large part by the Yogacara school of philosophy as well as the Huayan school. After textual learning was revived during the early Tokugawa period, most Japanese Sōtō monks still studied only well-known Chinese Buddhist scriptures or classic Chinese Zen texts. Eventually a few scholarly monks like Menzan Zuihō began to study Dōgen's writings, but they were the exceptions. Even when scholarly monks read Dōgen's writings, they usually did not lecture on them to their disciples. Shih-t'ou Hsi-ch'ien's (Shitou Xiqien, Sekito Kisen, 700–790) poem "The Harmony of Difference and Sameness" is an important early expression of Zen Buddhism and is chanted in Sōtō temples to this day. One of the poems of Tung-shan Liang-chieh, the founder of Sōtō, "The Song of the Jewel Mirror Awareness" is also chanted in Sōtō temples. Another set of his poems on the Five Positions (Five Ranks) of Absolute and Relative is important as a set of kōans in the Rinzai school. Other texts typically chanted in Sōtō Zen temples include the Heart Sutra (Hannyashingyō), and Dōgen's Fukanzazengi (Universally Recommended Instructions for Zazen). Today, when someone remembers Dōgen or thinks of Sōtō Zen, most often that person automatically thinks of Dōgen's Shōbōgenzō. This kind of automatic association of Dōgen with this work is very much a modern development. By the end of the fifteenth century most of Dōgen's writings had been hidden from view in temple vaults where they became secret treasures ... In earlier generations only one Zen teacher, Nishiari Bokusan (1821–1910), is known to have ever lectured on how the Shōbōgenzō should be read and understood. Beginning in 1905 Eiheiji organized its first Shōbōgenzō conference (Genzō e) ... Since 1905 it has become an annual event at Eiheiji, and over time it gradually changed the direction of Sōtō Zen monastic education ... Sōtan's lectures provided a model that could be emulated by each of the other Zen monks who came to Eiheiji. This model has become the norm, not the exception. Today every Sōtō Zen teacher lectures on Dōgen's Shōbōgenzō. While Eihei-ji owes its existence to Dōgen, throughout history this head temple has had significantly fewer sub-temple affiliates than the Sōji-ji. During the Tokugawa period, Eiheiji had approximately 1,300 affiliate temples compared to Sōji-ji's 16,200. Furthermore, out of the more than 14,000 temples of the Sōtō sect today, 13,850 of those identify themselves as affiliates of Sōji-ji. Additionally, most of the some 148 temples that are affiliates of Eiheiji today are only minor temples located in Hokkaido—founded during a period of colonization during the Meiji period. Therefore, it is often said that Eiheiji is a head temple only in the sense that it is head of all Sōtō dharma lineages. Sōtōshū Standard Procedures (Sōtōshū kitei). ^ But it is not the largest network as a school. About 30,000 temples in Japanese Pure Land Buddhism are split across over 10 legal entities. ^ a b Bodiford 1993. ^ Slater 1997, p. 218-219. ^ a b c d e f g h i Bodiford 2006. ^ a b c Masunaga 1964, p. 722. ^ Dumoulin 2005a, pp. 165–166. ^ a b Hall 1998, p. 625. ^ a b Yampolsky 1985, pp. 4–5. ^ a b Foulk & Year unknown. ^ Dumoulin 2005b, p. 128. ^ Dumoulin 2005b, p. 124. ^ a b c Dumoulin 2005b, p. 122. ^ a b Dumoulin 2005b, p. 125. ^ Dumoulin 2005b, p. 135. ^ Faure 1986, p. 47. ^ a b Dumoulin 2005b, p. 139. ^ Dumoulin 2005b, p. 140. ^ a b c Dumoulin 2005b, p. 142. ^ a b Faure 1986, p. 7. ^ Faure 1986, p. 8. ^ Prebish & Heine 2003. ^ Bodiford 1993, p. 81. ^ a b c Dumoulin 2005b, p. 207. ^ Dumoulin 2005b, p. 208. ^ Dumoulin 2005b, pp. 208–209. ^ a b Mohr 1994, p. 353. ^ a b Dumoulin 2005b. ^ Mohr 1994, p. 353-354. ^ a b c d Bodiford 1991, p. 450. ^ Heine & Wright 2000, p. 245. ^ Ford 2006, p. 141. ^ Ford 2006, p. 143. ^ Bodiford 2008, p. 330, note 29. ^ a b Bodiford 2008, p. 330 note 34. ^ Chadwick, David (c. 1997). "Crooked Cucumber: Interview With Tomoe Katagiri". Crooked Cucumber Archives. and "Dainin Katagiri Lineage". Sweeping Zen. Archived from the original on 2012-06-05. Retrieved June 2, 2012. ^ "United States Dharma Centers: Minnesota: Minneapolis". DharmaNet. Archived from the original on 2012-11-30. ^ "Directory of Religious Centers". President and Fellows of Harvard College and Diana Eck. Retrieved June 16, 2012. ^ Soto Zen Text Project. "Zazengi translation". Stanford University. Archived from the original on 2010-06-23. Retrieved 2008-03-26. ^ Soto Zen Text Project. "Fukan Zazengi". Stanford University. Archived from the original on 2008-04-29. Retrieved 2008-03-26. Anderson, Reb (2001). Being Upright: Zen Meditation and the Bodhisattva Precepts. Rodmell Press. ISBN 0-9627138-9-9. OCLC 44414111. Bodiford, William M. (1993). Sōtō Zen in Medieval Japan. University of Hawaii Press. ISBN 0-8248-1482-7. Bodiford, William M. (2006). "Remembering Dōgen: Eiheiji and Dōgen Hagiography". Society for Japanese Studies. 32 (1): 1–21. doi:10.1353/jjs.2006.0003. ISSN 1549-4721. Coleman, James William (2001). The New Buddhism: The Western Transformation of an Ancient Tradition. Oxford University Press. ISBN 0-19-515241-7. OCLC 48932003. Dōgen, Eihei (1971). Primer of Sōtō Zen: A Translation of Dōgen's Shōbōgenzō Zuimonki. Masunaga, R. (trans). (East West Center Book) University of Hawaii Press. ISBN 0-8248-0357-4. Faure, Bernard (1986). Visions of Power: Imagining Medieval Japanese Buddhism. Princeton University Press. ISBN 0-691-02941-5. OCLC 44599484. Ford, James Ishmael (2006). Zen Master Who? : A Guide to the People and Stories of Zen. Wisdom Publications. ISBN 0-86171-509-8. OCLC 70174891. Hall, John Whitney (1988). The Cambridge History of Japan. Cambridge University Press. ISBN 0-521-22352-0. OCLC 17483588. Harvey, Peter (1990). An Introduction to Buddhism: Teachings, History, and Practices. Cambridge University Press. ISBN 0-521-31333-3. OCLC 19589186. Heine, Steven; Wright, Dale S. (2000). The Koan: Texts and Contexts in Zen Buddhism. Oxford University Press. ISBN 0-19-511748-4. OCLC 41090651. Heine, Steven (2004). "Kōans In The Dōgen Tradition: How and Why Dōgen Does What He Does With Kōans". Philosophy East & West. University of Hawaii Press. 54 (1): 1–19, 19p. doi:10.1353/pew.2003.0052. ISSN 0031-8221. OCLC 1485347. Juergensmeyer, Mark (2006). The Oxford Handbook of Global Religions. Oxford University Press. ISBN 0-19-513798-1. OCLC 64084086. Kay, David N. (2004). Tibetan and Zen Buddhism in Britain: Transplantation, Development and Adaptation. Routledge. ISBN 0-415-29765-6. OCLC 51315294. Leighton, Taigen Daniel (2000). Cultivating the Empty Field: The Silent Illumination of Zen Master Hongzhi. Tuttle Publishing. ISBN 0-8048-3240-4. OCLC 43978646. Loori, John Daido (1996). The Heart of Being: Moral and Ethical Teachings of Zen Buddhism. Tuttle Publishing. ISBN 0-8048-3078-9. OCLC 42855782. Lu, David J. (1997). Japan: A Documentary History. M.E. Sharpe. ISBN 1-56324-907-3. OCLC 34876074. Masunaga, Reihō (1969) . Sekai hyakka jiten 世界百科事典. 13. Heibonsha. O'Halloran, Maura (2007). Pure Heart, Enlightened Mind: The Life and Letters of an Irish Zen Saint. Wisdom Publications. ISBN 0-86171-283-8. OCLC 83977483. Oldmeadow, Harry (2004). Journeys East: 20th Century Western Encounters with Eastern Religious Traditions. World Wisdom, Inc. p. 528. ISBN 0-941532-57-7. OCLC 54843891. Prebish, Charles S.; Heine, Steven (2003). Buddhism in the Modern World: Adaptations of an Ancient Tradition. Oxford University Press. ISBN 0-19-514698-0. OCLC 50730942. Senauke, Hozan Alan (April 2006). "A Long and Winding Road: Sōtō Zen Training in America". Teaching Theology & Religion. Blackwell Publishers. 9 (2): 127–132, 6p. doi:10.1111/j.1467-9647.2006.00274.x. ISSN 1467-9647. OCLC 38912788. Slater, Peter (1977). Religion and Culture in Canada: Essays by Members of the Canadian Society. Wilfrid Laurier University Press. ISBN 0-919812-01-5. OCLC 2157551. Spuler, Michelle (2003). Developments in Australian Buddhism: Facets of the Diamond. Routledge. ISBN 0-7007-1582-7. OCLC 49952207. Yampolsky, Philip B. (1985). The Zen Master Hakuin. Columbia University Press. ISBN 0-231-06041-6. OCLC 185642013. Sōtō Zen International Official homepage of the Sōtō school of Zen. Order of the Prairie Wind An independent order of ordained Sōtō Zen Buddhist priests founded by Rev. Nonin Chowaney. The International Zen Association Founded by Master Taisen Deshimaru in France for Europe. The IZA in the UK IZAUK is an affiliate of the International Zen Association. The Order of Buddhist Contemplatives The Order of Buddhist contemplatives founded by Rev. Master P.T.N.H. Houn Jiyu-Kennett. San Francisco Zen Center One of the largest American Sōtō Zen centers, founded by Shunryū Suzuki Roshi and his American students in 1962. SF Zen Center's Tassajara Zen Mountain Center was the first Sōtō Zen training monastery established in North America. Shasta Abbey Buddhist Monastery Official homepage of the Sōtō Zen Buddhist Abbey near Mount Shasta, CA.